Overall, this is a good book. It's not necessarily an entertaining one though. J.D. Vance does a great job narrating, to the point that you feel like you are with him in his stories. However, the stories are not always so nice. Vance describes a world of honor, bravery, and patriotism, but also of drugs, abuse, and poverty. Here are a few good things about this book. 1. It sticks a needle in the eye of identity politics. The myth of "white privilege" completely disintegrates. It's not J.D. 's point to get overtly political. He's just telling his story, but his story does not comport with the concept of systematic racism or white privilege. 2. J.D. has a lot of optimism and hope. He is not writing as one who gripes about his family or culture. He is proud of where he came from though he can see the flaws in "Hillbilly" folk ways. Vance's solutions are not government solutions. He cares for his people, and he knows they can achieve more stability. He's not the savior lighting the way, but he is the humble example of what can happen when other's help. 3. It focuses on a marginalized culture often left out of mainstream discussions. Awareness is raised. 4. This was written before President Trump was elected, but it explains perfectly why people elected him. Again, Vance isn't trying to write a political book, it just so happens that his story intersects with political questions. How can a professing Christian vote for a guy who has had all the affairs Trump has had etc.? Here's your answer. Here are a few not so good things. 1. There's a lot of language. I mean F-bombs, etc. throughout the entire book. Vance's point is to make things as real as possible, but he goes a little overboard. Sometimes it's unnecessary. If it were a movie I likely would not watch it. For the purposes of study I was able to get through, but found the language annoying at times. 2. 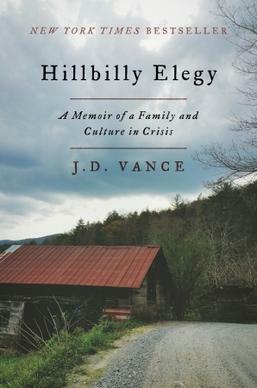 Vance's portrayal of hillbilly culture is accurate to a point. He is reading a culture through his experience. They are the descendants of Scotch-Irish mountain dwellers who spread out over the Midwest and upper South. I'm fairly skeptical that Vance's experience is the experience of all hillbillies. Northern Kentucky and Ohio are going to be different than Western North Carolina and Ozark mountain dwellers. In the same way, many of the issues Vance describes can be applied to western New Yorkers. My own experience as a repairman in upstate New York, Connecticut, and both Carolinas is what makes me a little bit skeptical. I feel as though I've met exactly who Vance describes in every place (perhaps not as much in CT) I've worked. I've also met the more committed church-going straight and narrow types as well. The rust belt and Appalachia, as well as the Deep South, contain mixes of Dale Earnheardts and Jeff Gordans, Hank Williams Jr.'s and Alan Jacksons. The people who indwell these regions are usually somewhere between "raising hell and amazing grace" to quote a Big and Rich album. Vance seemed to have been in an area, and in a family, that were a little more on the raising hell side of things. It's his story so this is not a bad thing, it just needs to be understood. 3. In Vance's sociological I wish there was a little more about the effect of modernity, Reconstruction, etc. This is because I have the history bug. Vance was under no obligation to do this, I know I would have wanted to insert something about how historically hillbillies got to the point they're at now. What happens when you break the pride of "dueling culture" through war, outsourcing, and persecution? (i.e. the War Between the States, Factories shutting down/poverty, and anti-Christian and anti-Southern rhetoric). What happens when a culture that takes pride in family names is now more confused genealogically, through hanky panky etc., than they ever have been? Sure these things are their own fault. Vance is right about that, but how did they get here? That's a story for another book perhaps. Oftentimes, the Great Society is blamed for the demise of the black family. It would be a true statement to say, "The black family collapsed because of internal moral failings." It would also be true to say, "The Great Society had something to do with it." Both are true in this case as well. I would still recommend the book for those who want to understand how Donald Trump came to be where he is (his mother is Scottish you know), or what kinds of real solutions impoverished people need. (Hint: They don't come from the government).